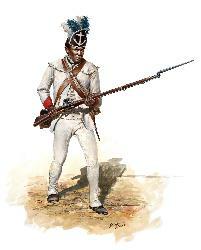 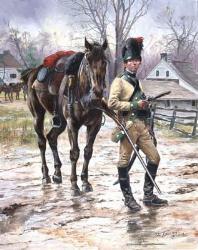 “I noticed a youth, a mere stripling, small, slender, almost delicate in frame, marching, with a cocked hat pulled down over his eyes, apparently lost in thought, with his hand resting on a cannon, and every now and then patting it, as if it were a favorite horse or a pet plaything.” Thusly was described Captain Alexander Hamilton, years after, by a comrade Continental Army officer recalling the “black time” of late 1776. 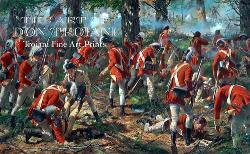 Thomas Paine could not have chosen a more apt title than “The American Crisis” for his new pamphlet, for Washington’’’’s army was now rapidly approaching dissolution. 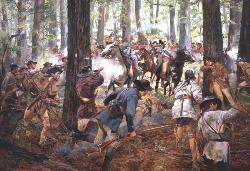 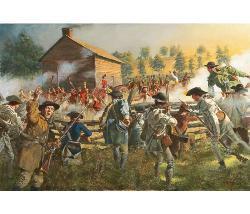 After capturing Forts Washington and Lee in mid-November, the combined British and German auxiliary forces had driven “the rebels” westward across the entirety of New Jersey, from the Hudson to the Delaware, the army of the new United States seeming like a fleeing animal about to be bagged or slain. 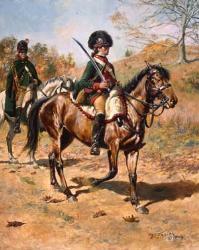 Hamilton had a great deal about which to be “lost in thought.” Most fortunately for the future of America, many among the Continental Army’’’’s top command had “noticed” the West Indies-born youth extraordinaire during the prior year. 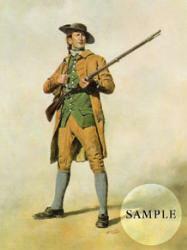 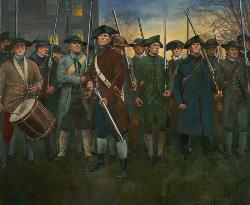 Having become fully charged with revolutionary ardor, the 20-year-old Hamilton dropped out of Manhattan’’’’s King’’’’s College – now Columbia – to form a militia company in 1775. Offered staff positions by both Nathanael Greene and Lord Stirling, he deferred, seeking a combat command, and in March of 1776, he was commissioned to command the New York Colony’’’’s Company of Artillery. 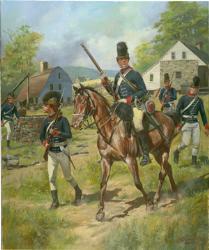 During the next nine months, his remarkable abilities were often observed by both General Washington and Continental artillery commander Colonel Henry Knox. 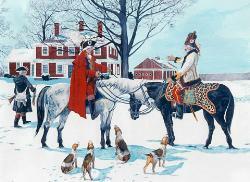 But it was now December. 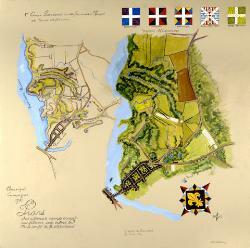 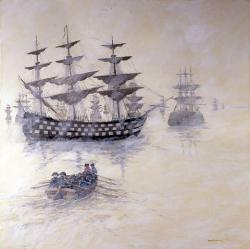 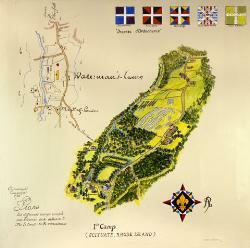 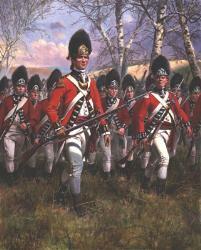 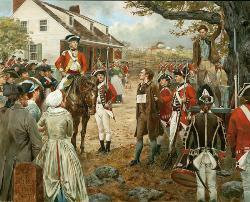 The 3,500-man shadow of the army was in profound peril along the Delaware River’’’’s Pennsylvania shore, even its commander contemplating in private correspondence that “the game is pretty near up.” British commander Sir William Howe, lacking the killer instinct, all but came to Washington’’’’s rescue by following the 18th century tradition of suspending active campaigning in winter. 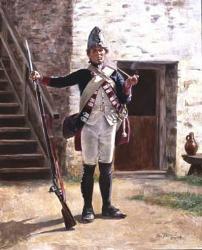 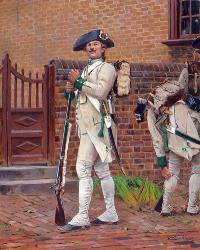 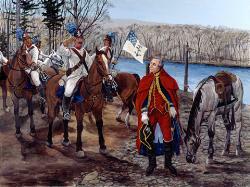 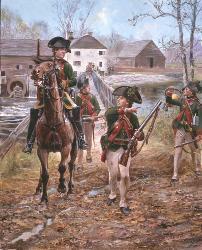 Howe chose to pull his troops back into winter quarters and await a spring resumption of combat, leaving one brigade of German Auxiliary troops – the now intensely detested “Hessians” – to winter at Trenton, virtually directly opposite the American “rebels.” With his innate aggressiveness and fully recognizing the depths of The Crisis, Washington determined that the die must be cast. 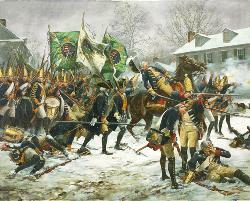 From its initial planning, the attack on Trenton would rely heavily on the rapid deployment and firing of artillery, Knox being designated by Washington to design the order of march and the complex logistics to pull off the river crossing and 9-mile nighttime trudge under what would become a continual blizzard of snow, sleet, and intermittent heavy rain, all within continually howling nor’’’’easter winds. 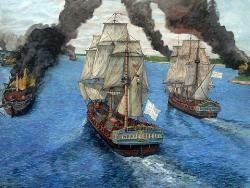 Beginning only long after nightfall on Christmas Day, a total of 18 guns, limbers, ammunition carts and horse teams were wrested aboard repeated flatboat ferry crossings, surrounded by great masses of floe ice. 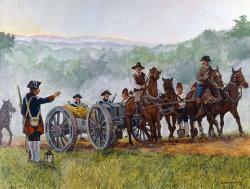 Once on the Jersey side, the artillery was strategically distributed among the infantry brigades in the line of march so to maximize the benefits of the Americans’’’’ lighter gun carriages and resultant swifter mobility in action. 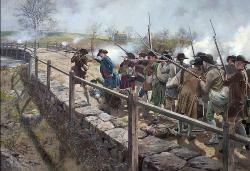 Washington’’’’s target was a December 26th “first light” attack on Trenton’’’’s garrison, but the operation was nearly four hours behind schedule as the mile-long column got underway. 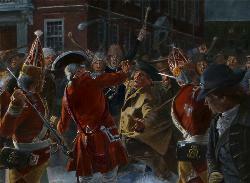 And the storm was getting worse. 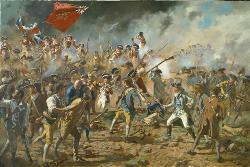 The grueling efforts would yield an epic of determination. 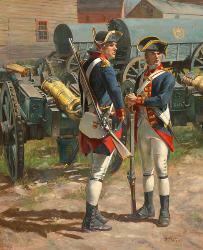 Most a hindrance to maintaining pace and schedule were the wheeled artillery pieces and their teams, made exceedingly more difficult by the icy road. 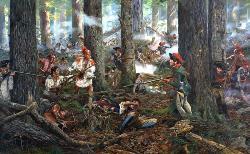 Lacking mechanical brakes, great attention and straining sinew were required from the men on any substantive inclines or, more cruelly, declines along the way. 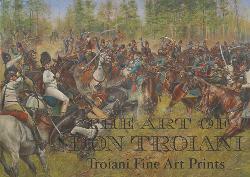 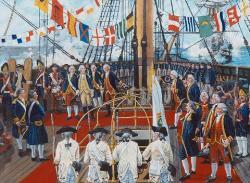 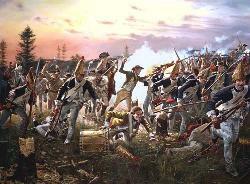 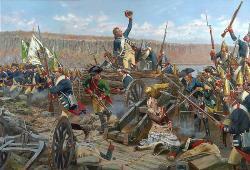 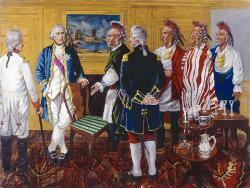 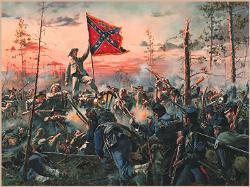 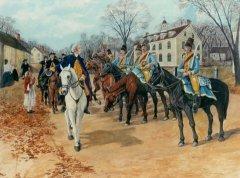 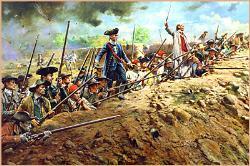 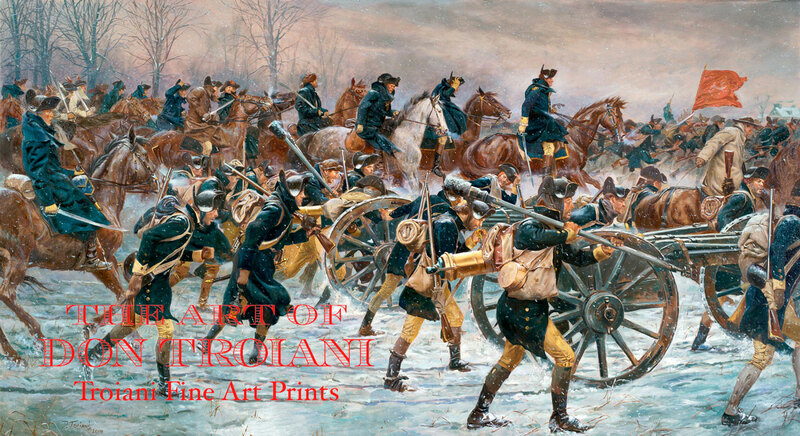 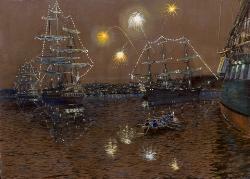 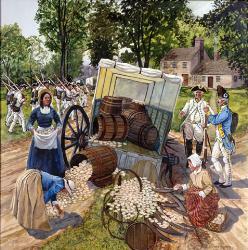 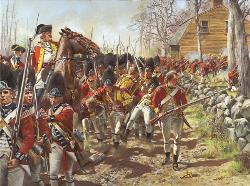 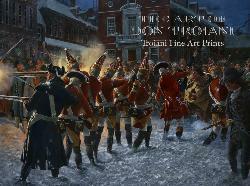 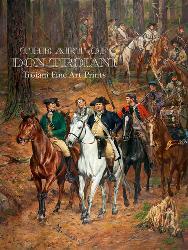 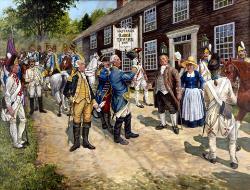 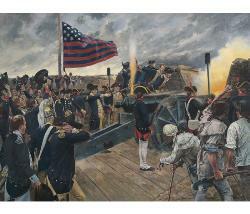 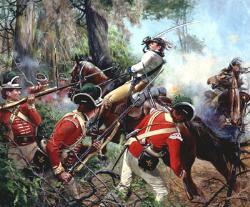 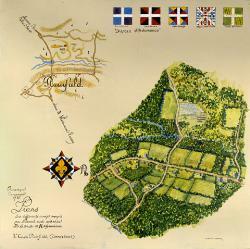 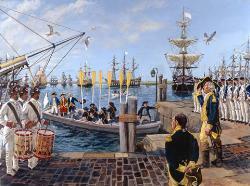 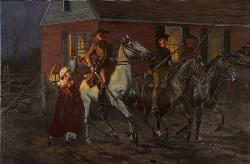 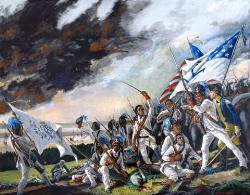 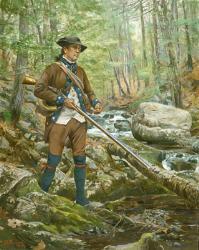 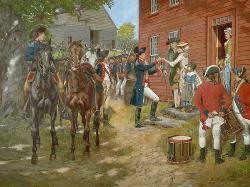 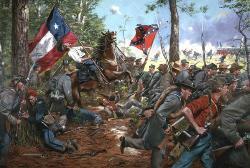 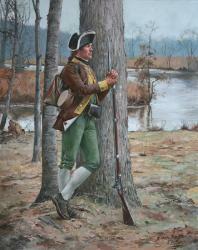 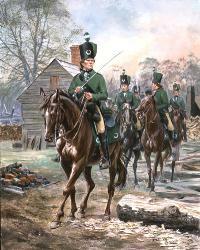 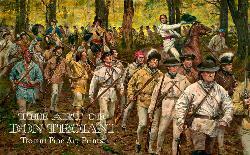 Master military artist Don Troiani here captures the moment the Continental march has reached the Trenton outskirts. 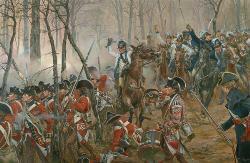 At far right, under their red banner, Virginia troops are breaking into a run, closely followed by General Washington, his silver-hilted sword in hand. 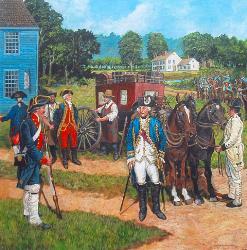 In the far-left foreground rides Captain Alexander Hamilton, directly following his New York State Artillery Company, its two bronze six-pound guns still tightly closed against the storm. 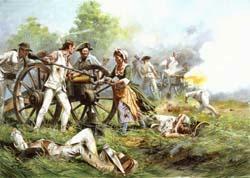 Shortly, under fire but atop high ground, these guns will be blazing with solid and grapeshot down Trenton’’’’s King Street.